By far, the most commonly used thing in my make-up arsenal… is my collection of brushes. It’s basically thanks to my brushes that I can achieve a look I want – and I think it’s not a stretch to say that a good brush can make or break a look. I have a question regarding maintenance for the brushes. How often shall I wash the brushes? Although it depends on how often you use the brushes, generally washing once every 1 – 2 month is enough. Please refer here for “how to keep the brush clean”. Please be noted that washing too often will cause the damage to brushes. This may come as a shock – since it’s commonly recommended to wash brushes often (every 1-2 weeks, not months!) to prevent bacteria building up. But then again, Hakuhodo do make some of the best brushes in the world, so I think their advice shouldn’t be dismissed too easily… Probably several things are at play here: I think if you use natural hair brushes, with powders, you can safely go along with this advice from Hakuhodo – I sure have, and nothing bad has happened. However, for synthetic fiber brushes used with cream shadows or liquid foundation, I’d definitely wash them more often… I think liquids are more likely to sustain bacteria compared to powders, and synthetic fibers are probably sturdier than natural ones, on average – so assuming the glue in the ferrule is strong enough, they can take a more aggressive cleaning regime. So, what can you do instead, if you want to follow Hakuhodo’s advice, and only deep-cleanse your brushes every month or two? You can do a quick, superficial clean. If you want to do this, here are your friends: the Artis brush cleaning pad, or some good ol’ microfiber cloths. I’ve been using this technique and couldn’t be happier. The huge advantages are: it saves me a lot of time, and also lets me use the same brush twice in a row, even with really different colors. Not to mention, like Hakuhodo suggest, it helps to preserve the brushes for longer. So, what is it? It’s a very flat metal box, which encloses a rectangular plastic slate. 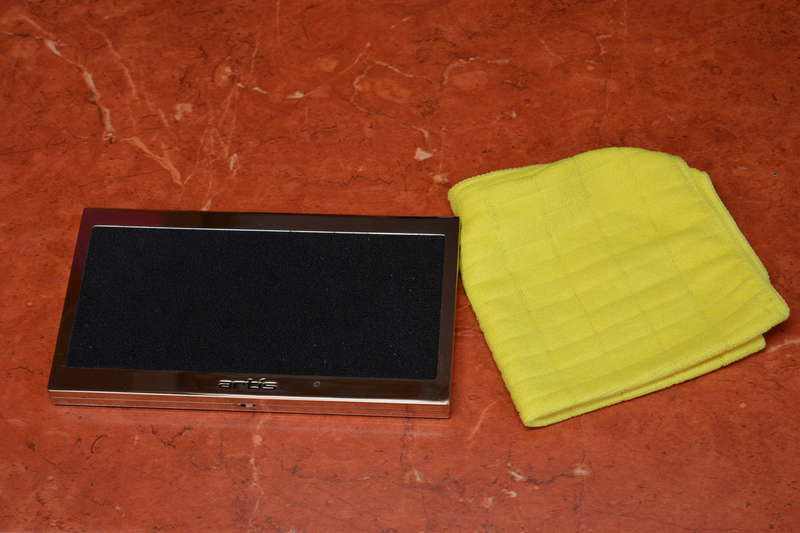 This slate can be removed, and is coated with a microfiber cloth – and it’s this cloth that you can replace in time. Of course, you can’t use just any replacement cloth… because sadly, the ones that would fit here need to have elastic edges to grab onto the slate securely. Basically, what you do is: go about your business as usual, applying your makeup with you brushes, and once you’re done with a certain color, you just swish the brush over the fabric, until you see the pigment has faded. It won’t be squeaky clean or anything (that’s where the deep clean comes in, every month or more), but you definitely won’t get any color transfer, even if you reuse it immediately. I much prefer this method over brush cleansing sprays, which should in theory achieve the same kind of superficial clean. However, I find that sprays usually leave some sort of residue on the brush hairs, which makes them less good at applying new pigment, and also nastier-feeling on the skin. So, the Artis Brush Cleaning Pad is a great tool – and it sure looks good on a vanity. 😉 But is it worth the incredible price? I, for one, don’t think so. Especially since you have to get replacement parts over time… I would much rather use the money for a new brush or some new make-up. But if you want to have a cool new toy and can afford it, this is a nifty little thing. Just watch out for the metal casing, it gets fingerprints really easily. Cheap alternative to the Artis Cleaning Pad! You can get these in packs of 2 or 4, in virtually any supermarket, and usually for only about £1-2! Once you use one to the point where it’s dirty all over, you can just throw it into the washing machine with the rest of your laundry. It comes out looking like new, and you can then reuse it. if you’re able to choose the color of the cloths, go for light ones. That way you can see immediately just how dirty they get. I suppose that is another advantage over the Artis, which comes only with black cloths and it’s sometimes hard to tell when it’s time to wash / replace them. microfiber cloths tend to come in different textures – some are more ‘woolly’ and look much like a miniature bath towel, and some are smoother and look more like a piece of silk. Go for the woolly ones: they tend to absorb the pigments from brushes much better – with less swirling and pressing. Overall, the idea is exactly the same: you apply the make-up, and when you want to clean the brush, you just swirl it over the microfiber cloth. You’ll be amazed how much of the pigments are sucked into the fabric, and off the brush! Below I loaded a brush very heavily with dark eyeshadow, and you can see that after some swirls, the color has greatly faded. Give it a go – it’s so simple and cheap, you just can’t go wrong!